"I'm Really Not Rude or Self-Absorbed; It's the Brain Injury"
Adam knows from his experiences as well as those of most of his friends with TBI that social situations can be difficult. Sometimes they know they can come off as "rude or self-absorbed" but that way of being, or seeming, is more a function of cognitive dysfunction. 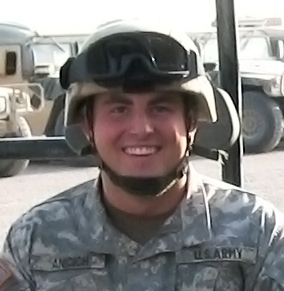 Read more about "I'm Really Not Rude or Self-Absorbed; It's the Brain Injury"
It's common for service members and veterans, like Adam, with a brain injury and/or post-traumatic stress to return home from combat and have intense feelings they don't know what to do with. But with help and patience, these emotions will settle down. Adam shares his experiences of having to push through the frustrating periods during his recovery from brain injury and continue to make progress. For people with combat-related TBI, being in unfamiliar places can be very stressful. Adam suggests starting slowly with a picnic or a walk and building up to longer getaways. For veterans and service members with TBI, getting help anonymously is available. But Adam encourages taking the courageous step to reach out for help. Adam didn't realize the ramifications of his TBI until he returned home, away from the combat environment. Social events can be quite draining for people with a brain injury. Adam says learning to give yourself the downtime you need — before and after the event — is helpful. Stops, lines, colors, directions — and lots of people rushing to and from trains. Riding the subway can be anxiety making and confusing, especially after a combat-related brain injury. Adam shares some strategies. An important event at work can take careful planning and energy — before and after the event. Adam shares some tips to help you "break a leg." Starting with an internship and assessing your skills and abilities post-TBI are two strategies to help you successfully return to the work force. Adam shares his experience.